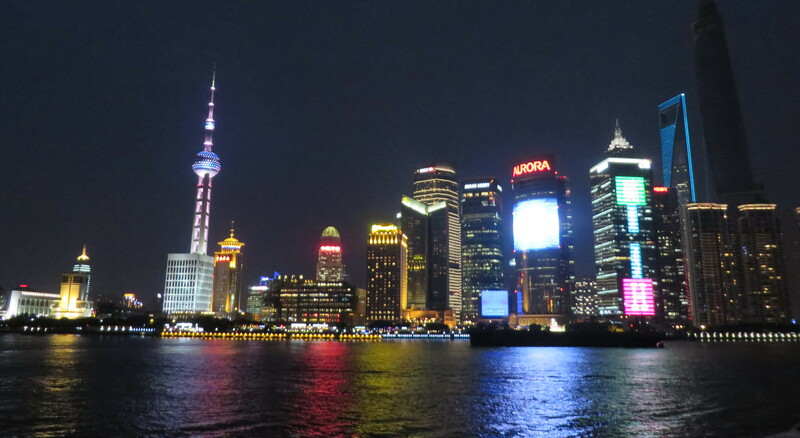 The glittery Shanghai skyline at night. After a full and interesting week in Japan, we arrived in Shanghai, city of 24 million, on the first leg of our China trip. 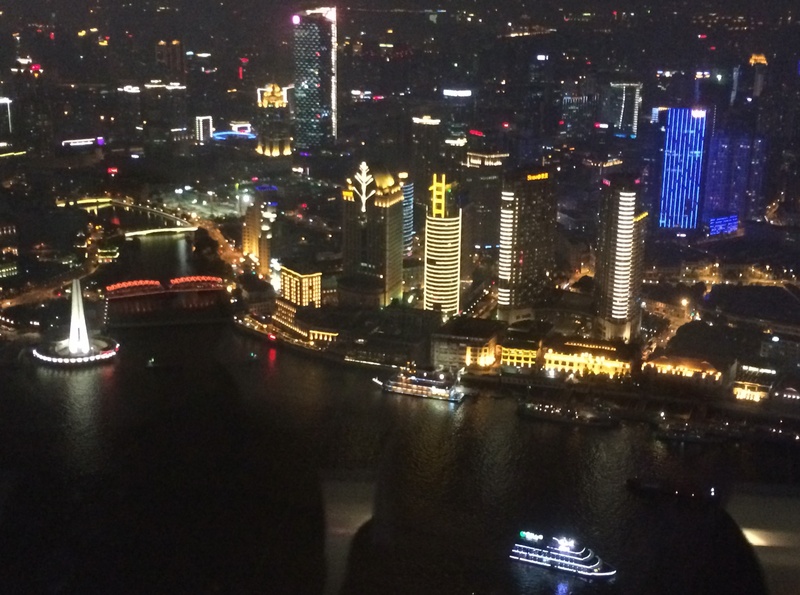 Shanghai is vast and still growing fast. We were met at Pudong Airport by two graduate students from Tongji University who escorted us onto the Maglev train for the 30 km trip at 300 km/hr into the city. Breakfasts in major hotels of both Japan and China are large East-West breakfast buffets, with a full array of breakfast foods for every taste and many nationalities. I gave two talks at Tongji, where there is a strong research program in marine geology. 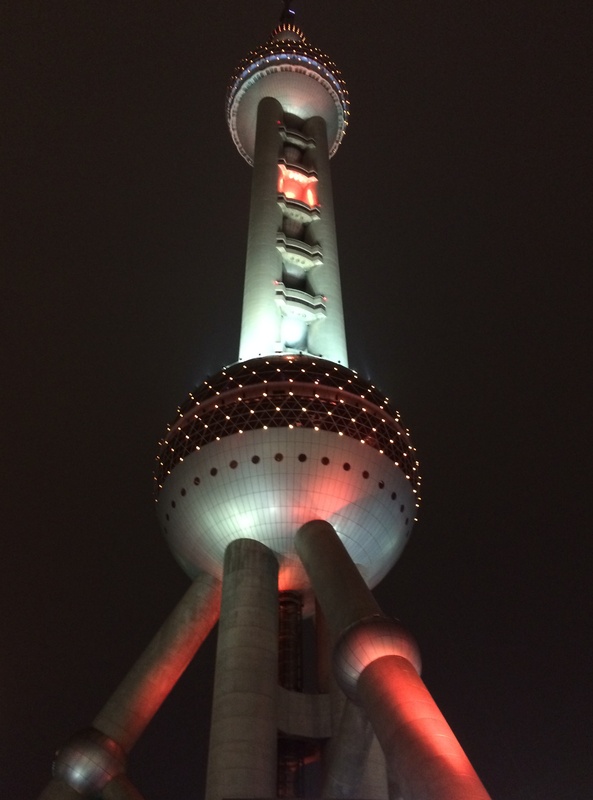 It was a treat to eat at the Oriental Pearl Tower, an atomic age rocket tower with a restaurant in the upper bubble, and a glass-floored overhanging observation deck. 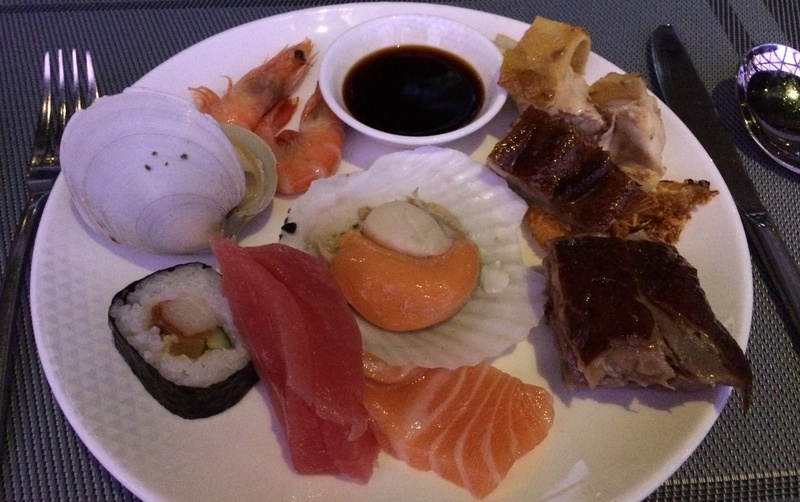 At the Oriental Pearl, I filled my buffet plate with nigiri tuna and other seafood eats. Look good enough to eat? It is a carving out of jade, but it sure looks realistic! Prof. Daidu Fan (left) of Tongji University hosted my visit in Shanghai. We pose by the posters announcing the GSA talks. The Shanghai skyline is instantly recognizable as no other, and a fascinating mix of historic and contemporary architectures. “The Bund” promenade has historic buildings and many shops. In the evening, flashes of multi-colored animated light displays ripple up and over the Pudong area skyscrapers across the river. The view from the skyscrapers is impressive. 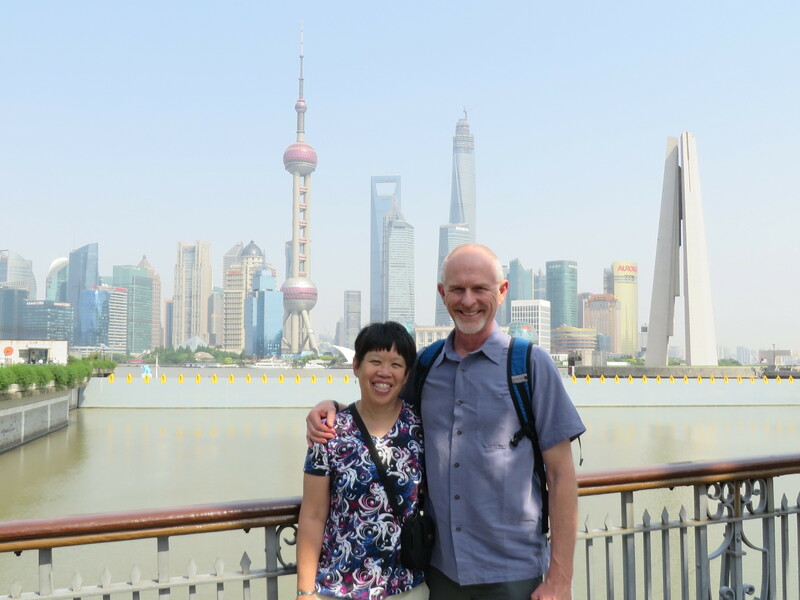 My husband John and I stand near the Bund, with the Shanghai skyscrapers in the background. 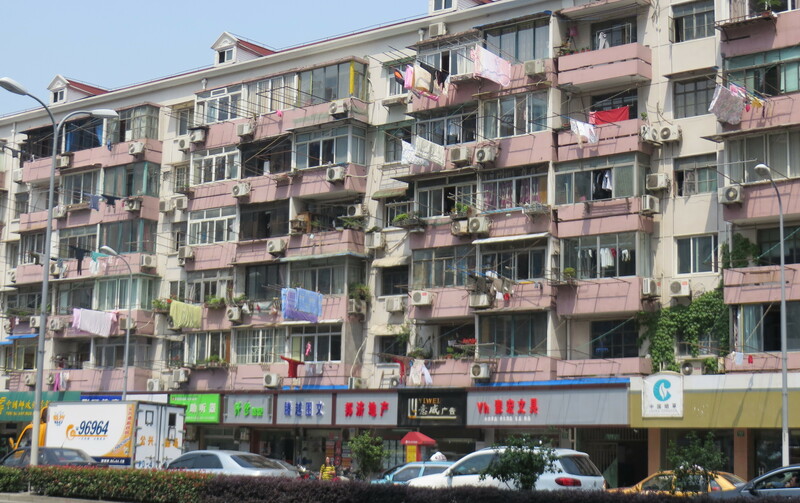 Tall apartment complexes are everywhere and many have long protruding rods to hang and dry clothes. 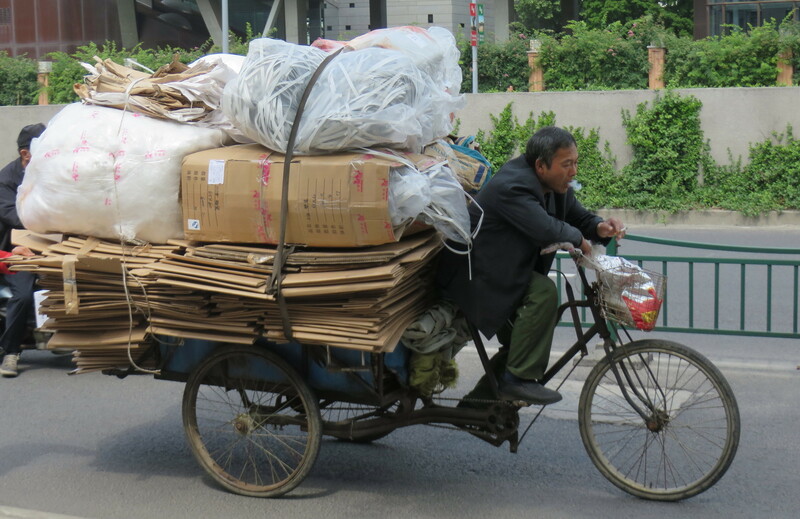 Bikes are ubiquitous in Shanghai, and some are toting heaving loads. In parts of Shanghai there are distinctive narrow streets and alleys. We had hot pot in Wuhan- yummy and a great social event! 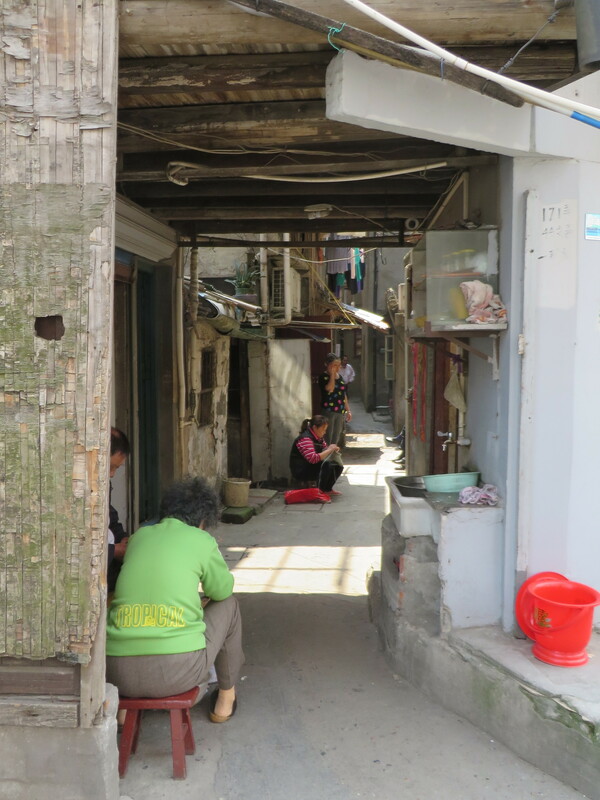 I noticed similar narrow streets and alleys in Chengdu as well; very rich in historical significance; I believe they refer these to The Wide (Kuan) and Narrow (Zhai) Lanes. As always, it is great to read your blog full of energy and life. Do they have Hot Pot in Shanghai?